Simply put- Cobra’s Power Flow Air Intake moves a lot of air! This is an instance where beautiful form and design is combined with outstanding function and performance. This Harley breather / air intake assembly bolts right on for a custom motorcycle look and gives performance increases across the board. Combine the Power Flow assembly with Cobra’s Fi2000 digital fuel tuner and a Cobra high flow exhaust system for considerable torque and horsepower increases. The Power Flow Harley breather assembly comes complete with a K&N air filter. Air flows better than competing systems because of the unique billet venturi design that is the heart of this eye catching air cleaner. The venturi form perfectly matches a machined aluminum velocity stack and creates a smooth vortex of airflow for maximum power. As Bob demonstrates, installation is a breeze. Install the pre-prepped breather bolts first. Route the rubber breather tubes through the backing plate and into their approximate position. Place the billet aluminum venturi against the front of the backing plate with a gasket on the back side and install the assembly to the throttle body. Evenly, tighten the hardware and join the Harley breather tubes to the breather bolts. Finally, install the K&N air filter with the chrome outer cover. Tighten the supplied hardware evenly and wipe up your fingerprints. Combining form and function, Cobra’s Power Flow air cleaner will enhance the overall look and performance of your Harley Davidson. Let’s continue with the install. 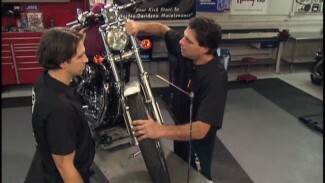 Bob and Mark demonstrate the process for lubricating your Harley’s steering head bearings and adjusting the fall-away. 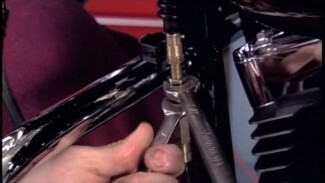 As always, Bob stresses the importance of adequately prepping all bolts, consulting your user manual to be sure everything is done correctly, covering any painted areas on the bike and, if possible, working with two sets of hands.